The problem with posting so sporadically to one’s blog is that one doesn’t always remember what one posted last before starting the next post. Hence, the back-to-back buffalo chicken-themed dishes. We’ll just have to push through. Since April I’ve been participating in a health and fitness accountability group on Facebook. If you’re on Facebook at all I’m sure you’ve heard of them. If not; they’re organized via Beachbody “Coaches” that post daily challenges, inspiration, and encourage you to check in with your daily workouts and food logs. And in case you’ve been living under a rock, Beachbody is the company that floods your early morning television with infomercials for programs like 21 Day Fix, Cize, P90X, etc. I’ve been taking it slow, especially in the beginning because of a knee injury this past spring, but now I’m fully on board with a cardio kickboxing-type workout called TurboFire and I follow the 21 Day Fix container system diet. It has really helped me get back on track with my weight loss, which sadly fell off course last year. Say what you will about multi-level marketing type business; it’s working for me so I’m sticking with it. The main goal of the 21 Day Fix eating plan is “Clean Eating”; no white flour, no sugar, no processed foods, very limited dairy, organic produce and meats (when possible). This has been an adjustment for sure – I haven’t been a big consumer of processed/boxed foods in a long time, but flour? Sugar? Artificial sweeteners? NO DAIRY ARE YOU SERIOUS? BUT CHEESE, MAN. (Well, 21 DF does allow a few cheeses in a small amount). To make this change has definitely been a challenge, but I’m adjusting well. There are a couple things I refuse to give up – namely the sweetener and half and half in my morning coffee. Since I drink two cups a day at most, I figure what Autumn doesn’t know won’t kill her. To keep in line with my new eating plan I’ve researched lots of recipes online (Pinterest is a big help with this), and thanks to my challenge groups I won Autumn’s book of recipes called Fixate (honestly, the recipes in that are great, even if you’re not following the plan). I’ve also started remaking some of my go-to recipes along the 21 DF guidelines. 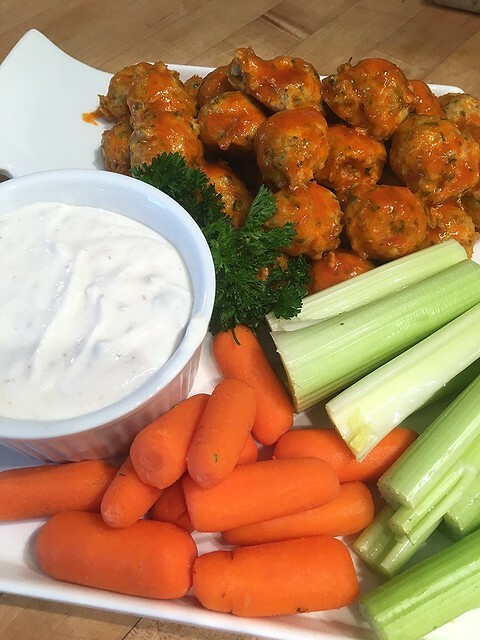 This was one of my first successful forays into “Fixifying” an old favorite, buffalo chicken meatballs. 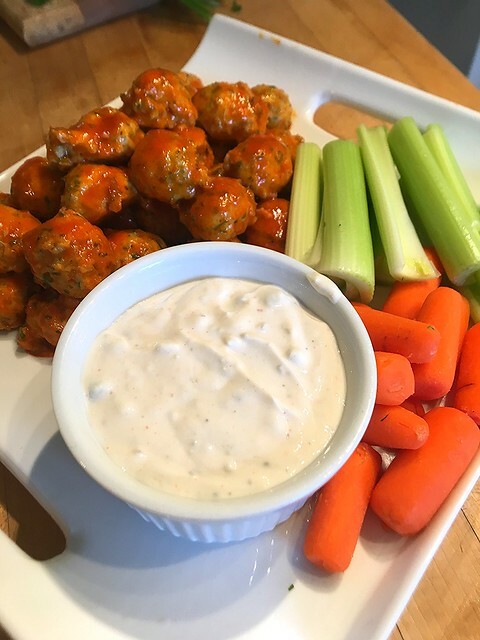 The original recipe wasn’t that bad, with the exception of the butter in the sauce, but when you serve the meatballs alongside super creamy ranch or blue cheese dressing, it’s a no-go. 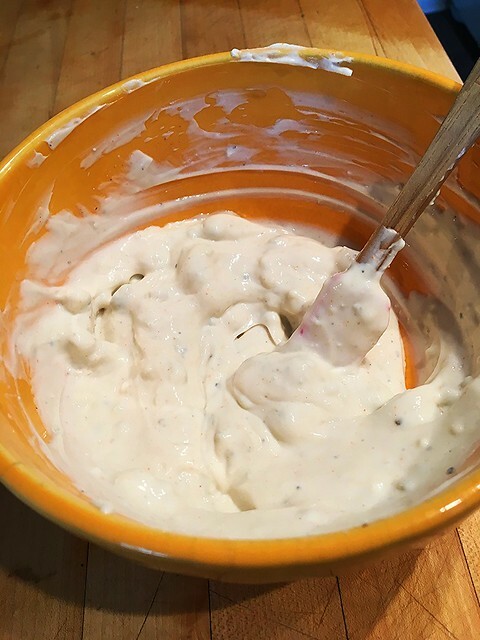 So I made a (semi) Fix-Approved dip to accompany the meatballs as well. 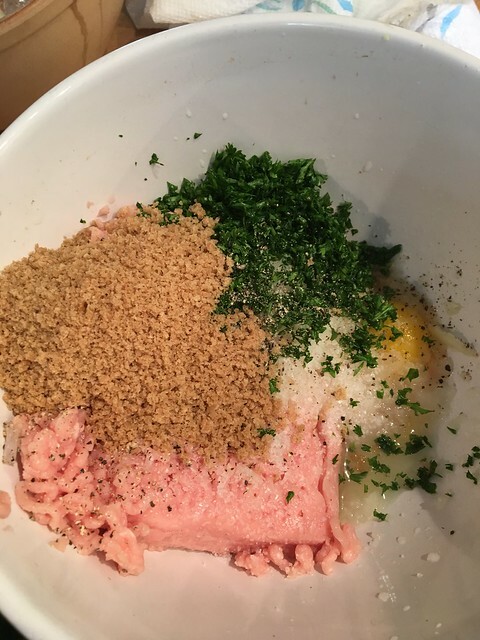 You just mix some ground chicken up with whole wheat bread crumbs, grated onion, one egg, parsley, and seasonings, form into balls with your hands (or a mini ice cream scoop), and bake. 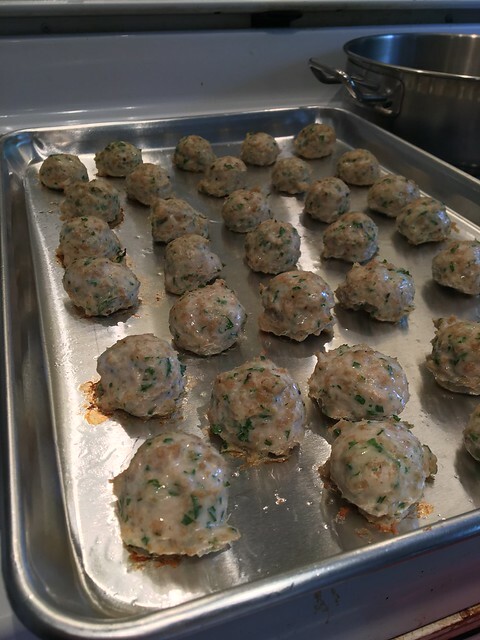 While the meatballs are baking stir together greek yogurt, white vinegar, spices, and a small amount of blue cheese crumbles and set aside. Note: Blue cheese isn’t specifically allowed on the Fix, but it’s such a small amount and you’re only using 2 TB or so of the dip, so. Pick your battles, I guess. Melt a tablespoon of coconut oil in a pan and stir it together with your favorite hot sauce. 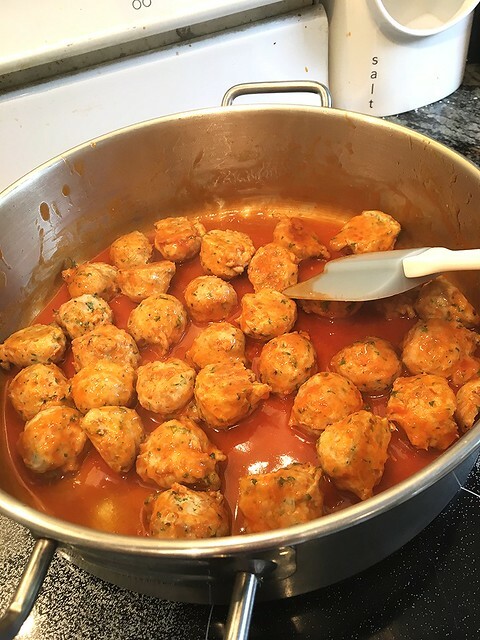 Toss the meatballs in the hot sauce mixture. And serve immediately, with the dipping sauce and some veggies on the side. Who needs wings? Not this lady. Mix all ingredients together well. Form into balls (use a mini ice cream scoop, if you have one) and place onto a baking sheet sprayed with cooking spray (coconut oil preferred). Bake at 375 degrees for 15-18 minutes or until cooked through. Melt coconut oil in a large pan and add hot sauce. Stir together to combine completely. Add cooked meatballs and toss in the sauce to coat well. Serve with dipping sauce and vegetables of choice.